Typhoon KOMPASU was small, so the extent of damage is very different even inside Okinawa main island. In the south, Naha was not affected by the typhoon, while in the north, Nago and nearby islands were suffered from extensive blackout, which is still not be solved. A small typhoon like this causes damage in the narrow area. 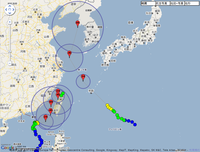 This typhoon then moved northward in East China Sea, and is now approaching Korea. Jeju island and the southwestern part of Korea is now within the 30kt gale wind circle. It still keeps intensity, and considering the situation of Nago, strong winds may have higher impact than heavy rains. Forecast says that this typhoon will pass near Seoul and move to Japan Sea off the east coast of North Korea. The typhoon will then be transformed to extratropical cyclone, and may bring heavy rains in Tohoku and Hokkaido. Typhoon KOMPASU has passed in the northern part of Okinawa main island around 17:00 JST on August 31th (Track information). The typhoon has passed exactly above Nago city, and Miyazato in the city recorded the maximum gust of 49.8m/s. Izena, which is located in the right-hand side to the moving direction recorded the maximum gust of 56.4m/s. Okinawa main island has already escaped from the storm wind circle, and will soon escape from the gale wind circle. Typhoon KOMPASU keeps intensification while drawing near to Okinawa main island. This is a small typhoon, but has a beautiful spiral shape, so the direct strike of this typhoon may bring severe rains and winds in a short period of time. Weather radar image clearly shows the eye in the center. The satellite image below also shows that the eye is getting visible. Track information tells us that Okinawa main island is now within the 30kt gale wind circle, and will soon get into the 50kt storm wind circle. Typhoon KOMPASU is a compact typhoon because Typhoon LIONROCK and Typhoon NAMTHEUN are present nearby. 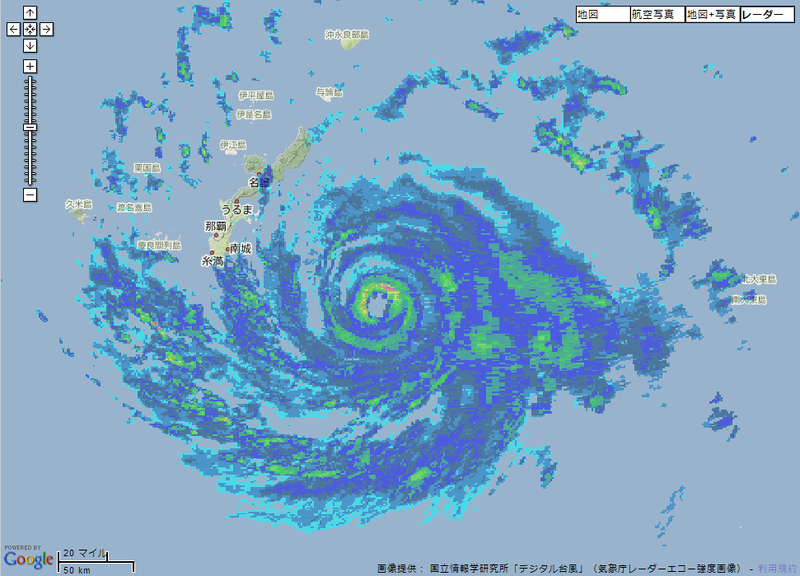 Weather radar image already captures the spiral of the typhoon, and the eye is also visible in the center. This typhoon is now moving northwest in south of Minamidaito-jima, and is forecast to pass near Okinawa main islands just after noon. Because three typhoons are born in a small area, typhoon track forecat looks very complicated. 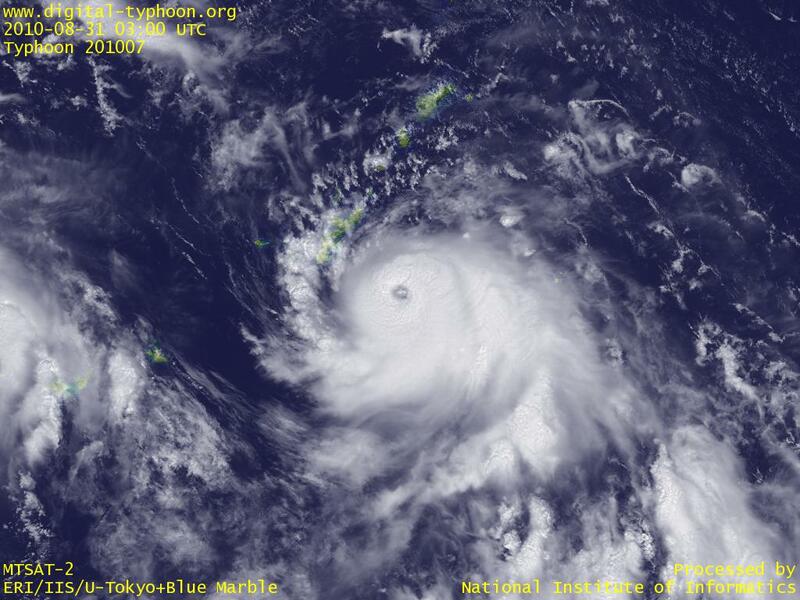 Typhoon KOMPASU was formed in south of Japan. This typhoon is forecst to move toward Okinawa. From the east of South China Sea to south of Okinawa, there are a few tropical cyclones including Typhoon LIONROCK, so there may be no space for Typhoon KOMPASU to develop into a large typhoon, but its shape is balanced, so it may intensify more under favorable conditions.